Saturday we celebrated Linda’s birthday. Linda is the 3rd FAB to celebrate her birthday this year. Linda’s “actual” birthday is August 10th but finding a date that 5 busy people can get together on line always proves to be a challenge. It almost always has to be a Saturday if we want to sew, and we WANTED TO SEW! So a date was picked–August 13 and everyone agreed to be there. Linda is a lover of 30′s reproduction fabrics so I knew whatever I made, it had to be made from 30′s fabrics. I decided to make some things for Linda that I use a lot myself. The first thing I made was a mug organizer/pinafore. I have one of these organizers attached to a mug on my sewing desk that is jammed full of all those little items you can’t sew without that are easy to loose in a mass of fabric when you are sewing like, a seam ripper, ruler, marking pens, pencil, wooden iron, etc. The pattern was from a kit that I received during a local quilt shop hop some years ago. 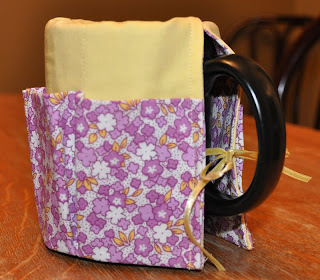 The second item I made was a bag for Linda to take her mug to class or guild with her. Our guild charges a quarter for a Styrofoam coffee cup if you forget to bring your own ceramic mug with you to guild as we are trying to promote the green option. I thought Linda’s guild might have a similar practice. I told Linda that my mug gets washed when I get home from the guild meeting and it is put right back into its bag along with my name badge so I am ready for the next meeting–just grab my bag and go. I think Linda is going to adopt this process as well. The outside of the bag has a number of pockets–designed to hold a spoon, tea bag, sugar packet, etc. The pattern for the mug tote is from an Australian Patchwork and Quilting magazine some years ago. 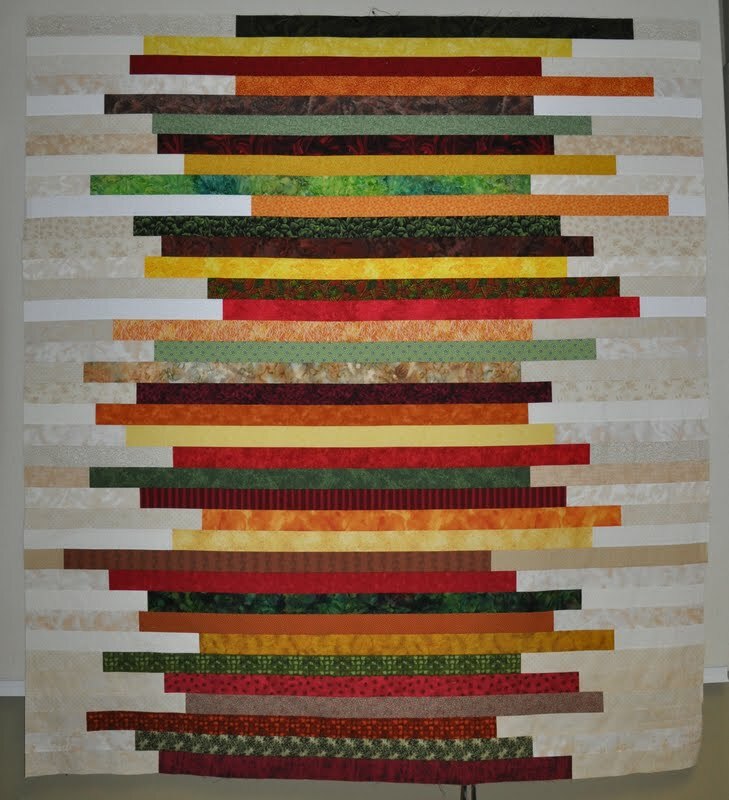 Allpeoplequilt.com has featured a second colourway called, Skinny Strips, with a picture here: http://www.allpeoplequilt.com/projects-ideas/throws-wall-hangings/skinny-strips_1.html. 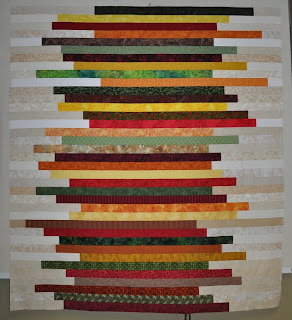 In true challenge fashion, I was having difficulty trying to decide on what “collection” of strips to use to make my version of this quilt. All I knew for sure was that I wanted to use existing stash–no additional purchases. I cycled through ideas including something patriotic–just red and white, something Hawaiian–using some of my Hawaiian-themed fabrics purchased in Hawaii, and something chicken related–using some of my extensive collection of chicken/rooster fabrics. I finally decided on a fall-themed version on Saturday morning. Nothing like leaving the decision to the last minute! Because I was late in making the decision on which fabrics to use, I was not 100% ready to start sewing when everyone else was ready to sew. Some of my strips were pulled from my totes of pre-cut strips. I did have to cut a few more background pieces and a few more reds, yellows, and browns to complement the strips I already had cut. This entry was posted in birthdays, FAB challenge, flimsy, line art, skinny strips by Norma Hanson. Bookmark the permalink. I love how this turned out, Norma. Well done. Thanks for hanging out with me on Sunday while we got down to the finish line. Thank you too for being part of a memorable birthday par-tay! I love my two 30′s themed items you made for me and will tell everyone who sees them that YOU made them just for me. What wonderful projects to work on!!! Sounds like you had a wonderful day!